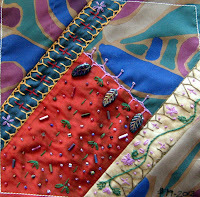 Those of you who've followed me for awhile know that I often add hand-stitching, beading and/or embroidery to my pieces. This was certainly true of "Trio", my Final Assessment Piece for my C&G certificate, and of the 21 (so far) crazy quilt blocks I created last year using recycled neckties. I've also done needle-turn applique -- my sister can attest to that as she was the recipient of two hand-done pillow shams a couple of years back -- and belonged at one time to The Applique Society. I say all this because, well...it means I know how long it takes to work by hand -- so much so that I thought of adding that phrase to my blog name when I updated my 'look'. But...these hand-workers in needle-turn applique put an entirely new perspective on "however long it takes". The video below, made by Bonnie Lyn McCaffery at the Festival of Quilts in 2011, gives you a glimpse into the work of the Tentmakers of Cairo, whose millennia-old craft is in danger of becoming extinct. Why? It goes back to what Seth Godin mentioned about the "scarcity-based" consumer attitude prevalent in the West today: buy as much stuff as you can for as little money as possible, so you'll appear 'trendy' and 'current' without much effort. Here in bedding box stores in shopping malls, you can find hand-quilted bed-quilts for as little as $150.00 -- made in China. To make even a twin-sized bed-quilt with good-quality cotton bought locally, and to hand-quilt it, can take weeks or months, and costs that much for material alone (the going price for a metre -- 39" or so -- of 22 cm (45") wide cotton in Canada runs between $9 and $17. Ten metres, and you have your $150, and you haven't even cut the fabric. The same thing is happening with the tentmakers' craft -- people are devaluing it by purchasing cheaply-printed panels, imported...you guessed it...largely from China. Now take a look at this work and ask yourself...which would I rather have? A masterpiece, or a cheap knock-off? You can learn even more about this work from UK artist Jenny Bowker, whose work has been influenced by the designs of these makers, and by her life experience and travels in the Middle East, and from her friend Kim Beamish, who is taking up the tent-makers' cause in a film he is creating, for which funding is badly needed. "After [his speech in the Areopagus], Paul left Athens and went to Corinth. There he met a Jew named Aquila, a native of Pontus, who had recently come from Italy with his wife Priscilla...Paul went to see them, and because he was a tentmaker as they were, he stayed and worked with them..."
Thank you for this great post. It definitely highlights the amount of work that goes into these Tentmaker pieces as well as a few other great issues and questions asked about their work. I have spent six months shooting a documentary about the Tentmakers of Cairo and will be filming for at least another six. So we are running a supporter campaign through pozible.com/tentmakers to allow us to get to the next stage of production. So if people are interested in supporting the work of the Tentmakers of Cairo and the film have a look.